THE PUBLISHER: Silver Birch Press, Los Angeles, CA http://www.silverbirchpress.com/. SUMMARY: The Hollywood Catechism exposes our addiction to pop culture, our fixation on celebrity worship, and our suspicion of religious ideas. Each poem is a small lens flipped to reveal an alternate universe into which the reader enters bravely with no exit sign in sight. Blending socio-political satire with suffering and sentiment, the poems in this collection manage to acknowledge our shenanigans while celebrating our humanity. In the end, poetry triumphs as our world is hoisted with its own petard. THE BACK STORY: I’ve been writing poetry infused with satire since the early seventies and have always found inspiration and encouragement in such poets and writers as Frank O’Hara, Dorothy Parker , Joseph Heller, Sharon Olds, Edward Field, Kurt Vonnegut Ann Menebroker, A.D. Winans, and Paul Krassner–to name just a few. Heller’s post-war masterpiece, “Catch-22,” Field’s groundbreaking book of poems, “Variety Photoplay,” and Krassner’s wicked reporting in “The Realist,” were all catalysts for me to explore the depth and history of satire at an early age. Mining popular culture and using it in service to poetry makes just as much sense to me and my poems as references to ancient Rome and Greece does to certain academic poets and their work. While contemporary satires have always run the risk of being yesterday’s news, they have also provided an urgency and immediacy that directly touched people. Human action, reaction and interaction have always intrigued me and informed my work. In The Hollywood Catechism, cultural icons like Elizabeth Taylor, Jesus, and Joe DiMaggio join hands with Freud, The Three Stooges, and Ann Landers; Burt Lancaster, Charles Bukowski, and Johnny Unitas break bread with Wallace Stevens, Dean Martin, and Dinah Shore. And while U2’s Bono and Tyrone Power’s Zorro haunt each other’s dreams, the Marx Brothers discuss opera with Oprah. In a wickedly satirical poem like “Sinatra, Sinatra” the crooner’s name is repeatedly taken in vain. The irreverent appeal of such poems as “The Actor’s Creed,” “The Halle Berry” and “Prayer of the Talking Head” is due, in part, to their paying homage to the history and power of the artfully executed lampoon. In addition, the book’s empathetic bridge poem, “Howl of Lon Chaney, Jr.” is not just a parody of Allen Ginsberg’s epic poem “Howl,” but a luminous work that stands on its own merits. WHY THIS TITLE? I wanted a title that wedded the notion of celebrity worship with the cult of religious zeal. The Hollywood Catechism fit that bill. For the book’s cover, my editor and I decided on the image of Burt Lancaster (as Elmer Gantry) holding a bible, which was an ideal choice to complement the title poem. WHY SOMEONE WOULD WANT TO READ IT: There’s plenty of room at the table for all kinds of poetry, especially the kind that doesn’t fit someone else’s perception of what poetry is supposed to be. I believe one good reason to read The Hollywood Catechism would be for the laughter it might arouse–something we could use a lot more of in these dark and absurd times. Another reason might be to gain a better understanding and appreciation of contemporary American poetry and its place in our lives. This collection does more than just round up the usual suspects. The Hollywood Catechism is an invitation to suspend belief, bend the rules, and begin reading poetry as a means to connect on a level that is more direct and honest than a quick text or a Facebook “like”. These are poems that read like the messages in a bottle that might be written by the last sane man on Earth, when everyone else has gone mad.” — Robert Peake, The Huffington Post https://tinyurl.com/HuffPost-THC-Fericano. “[A] characteristically American blend of flim-flam, movie idols, and popular Christianity sets the tone of this entertaining and original book.” — Jendi Reiter, Reiter’s Block https://tinyurl.com/ReitersBlock-THC-Fericano. “This is a book…firmly rooted in the American culture and mythology of the 1950s. Anyone, regardless of age or era, will pick up on the humor and rage coming through these poems.” — Patrick T. Reardon, Pump Don’t Work https://tinyurl.com/PumpDon-tWork-THC-Fericano. Fericano’s poems [are] short and snappily inventive like a fast-talking Raymond Chandler.” –Charles Pitter, Zouch Magazine https://tinyurl.com/Zouch-Fericano “A wonderfully witty and satiric book…what these poems do is make explicit what’s implied by celebrity culture: they pretend to take the idea of celebrity worship literally.” — Jerome Sala, Espresso Bongo https://tinyurl.com/EspressoBongo-THC-Fericano. AUTHOR PROFILE: I’m a poet, satirist, social activist and co-founder of Yossarian Universal (1980), the nation’s first parody news service (yunews.com). My poetry and prose have appeared in numerous publications and media outlets in this country and abroad, including: The New York Quarterly, The Cafe Review, Inside Joke, Mother Jones, Poetry Now, Projector, The Realist, Saturday Night Live, SoHo Arts Weekly, Vagabond, Mi Poesias, National Public Radio, The Wormwood Review, and Catavencu Incomod (Romania), Charlie Hebdo (Paris), Il Male (Italy), Krokodil (Moscow), Pardon (Germany), Punch (London) and Satyrcón (Argentina). My chapbooks and books of poetry and fiction include: Cancer Quiz (Scarecrow Books, 1977); Commercial Break (Poor Souls Press, 1982); The One Minute President (with Elio Ligi / Stroessner Verlag, 1986); and Interview with the Scalia (Peabody Press, 1992). Loading the Revolver with Real Bullets (Second Coming Press, 1977), a collection of my work partly funded by the state of California, achieved notoriety in 1978, when one of its poems, “The Three Stooges at a Hollywood Party,” was read on the floor of the California State Senate as a reason to abolish the California Arts Council. I’m the founder of Stoogism (1976), the mock-literary school Allen Ginsberg once praised as “the only movement with a punch line.” In 1982 I received the Howitzer Prize for my poem, “Sinatra, Sinatra,” an award I created myself and exposed as a literary hoax to reveal the absurd nature of competitive awards. As irony would have it, the following year my book of poems, Commercial Break, received both the Prix de Voltaire (Paris) and the Ambrose Bierce Prize (San Francisco) for upholding the traditions of socio-political satire. From 2003 to 2016, I served as director of SafeNet / Instruments of Peace, a nonprofit that helped clergy abuse survivors and religious leaders focus on recovery and reconciliation (mysafenet.org). In 2013, along with fellow survivor Olan Horne, I was instrumental in advising Cardinal Sean O’Malley of Boston on the creation of the Vatican’s international commission on clergy abuse. I currently write a blog (A Room With A Pew) on issues regarding clergy sexual abuse and the healing process (roomwithapew.com). Born in 1951, in the Bayview / Hunters Point area of San Francisco, I grew up in the shadow of Candlestick Park in the nearby neighborhood of Visitacion Valley. I presently live on the San Francisco peninsula. If you’d like to learn more about me and my work, you can read the interviews I gave that appeared on the following websites: “The Best American Poetry” (2017) https://tinyurl.com/BAP-Fericano “Michael Limnios’ Blues Network” (2013) https://tinyurl.com/BluesGr-Fericano. AUTHOR COMMENTS: Trying to get people excited about poetry is a little like defending Trump’s intelligence. There is so much disbelief, distrust and disconnectedness present that it becomes a challenge just to keep the eyes from glazing over. With poetry, there is an aversion among those who, at some point in their lives, have been turned off by the obtuse language, obscure meanings and/or sheer weight of the corpse they were told to dissect. This is true of many who were exposed to poetry in grammar school, forced to read it in high school, and even of some who reluctantly chose to study it in college (in some form) and then found themselves in the awkward position of analyzing work they either detested or didn’t understand. I purposely set out to debunk a lot of this when I taught poetry in the schools many years ago. Poetry was not dead in my classes. It was alive and vibrant and relevant in the lives of those who chose to meet it half way. 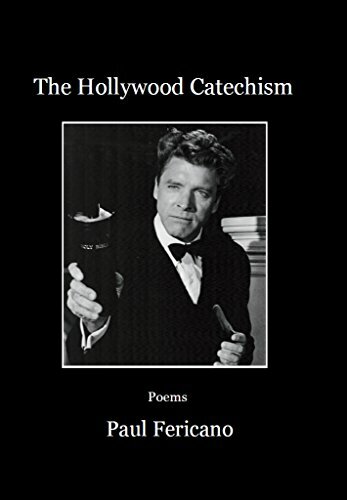 Like every collection I’ve published since 1976, The Hollywood Catechism is an attempt to reconnect people with all types of poetry, including poems that utilize humor and satire. In some ways it’s a radical idea to believe that a poem can be enriching, entertaining and (god forbid) enlightening. All poetry (all art) is political by nature. It rebels against the status quo by virtue of having something different to say. At its core is the notion that poetry can be a public service for people to lean into. Some might think this is an impossibly tall order in an easily distracted, smart-phone world. But I believe it’s just as applicable and relevant today as it was when the telephone, movies. and television were first introduced into a society where people read books, magazines and newspapers more regularly than brushing their teeth on a daily basis. SAMPLE POEMS: Here’s a link to the online journal, Poetry Hotel, where three poems from The Hollywood Catechism are posted: https://www.yunews.com/paul-fericano-poetry-hotel. LOCAL OUTLETS: Bird & Beckett Books (San Francisco) East Bay Booksellers (Oakland) Diesel, A Bookstore (Santa Monica) Books, Inc. (California). WHERE ELSE TO BUY IT: Regular copies of The Hollywood Catechism can be ordered online: Amazon – (paperback and kindle editions) – https://tinyurl.com/amazon-THC-Fericano Barnes and Noble – https://tinyurl.com/barnesandnoble-THC-Fericano Signed (paperback) copies of The Hollywood Catechism can also be ordered directly from me (postage paid): Paul Fericano, YU News Service, P.O. Box 236, Millbrae, CA 94030.